The NFL’s quarterback problem is as severe as any position across all sports. There’s not nearly enough decent or better starters to even fill out all 32 starting jobs, let alone try to be two or three deep on a roster. As soon as an average-ish or better signal-caller goes down for more than a few weeks, that team is essentially screwed, and it causes panic as jobs and reputations are on the line. Longevity is a rare description for decision-makers, coaches and players alike. In the case of the first two, this is often due to relying on familiar faces instead of stepping outside of their comfort zone. Sometimes this works both on and off the field, as it’s important to have buy-in throughout the locker room, and occasionally the coach acquires talent that isn’t over-the-hill or depleted after years of enduring a beating. This especially extends to quarterbacks, which is otherwise a position that usually sees little turnover from year-to-year until a coaching change is made. Theoretically, the biggest benefit of bringing in a player from a coach’s past is the advantage of little adaptation time with learning the playbook and verbiage of the scheme. In addition to this, the coach should have a better knowledge of strengths and weaknesses of the player, thus the tweaks that’ll come may be less limiting than what another player may bring. And that is why the Miami Dolphins were set on bringing Jay Cutler out of retirement to help fill Ryan Tannehill’s shoes for 2017. With few outside options better than incumbent backup Matt Moore and little time to prepare a different quarterback, it made sense for head coach Adam Gase to press Cutler into taking Miami’s $10 million over Fox’s $450,000. Cutler took little time to accept, about one full day from when official numbers were exchanged this past Saturday. And nobody should blame him; he’s 34 years old, coming off his seventh-straight season missing at least one game, and an offseason labrum surgery. There’s little doubt this will be Cutler’s swan song, and one that was only made possible when Tannehill’s knee buckled. Though Gase earned deserved praise for squeezing the most out of Cutler in 2015 in their lone season together, the league had long lost their lust for the physically gifted but maddeningly nonchalant and inconsistent approached quarterback. It’s not that Cutler’s been a bad player, but his peaks haven’t been worth the valleys since the early 2010’s. Despite being ravaged with injuries and having a mediocre offensive line in 2015, Gase and Cutler created an efficient season together, thanks to Gase’s usage of modern concepts that cut down the quarterback’s responsibility on a play-by-play basis. Instead of asking Cutler to be the gunslingin’, deep-ball throwin’ threat that his arm strength would indicate he’s capable of, Gase cut his deep attempts to just 62 tries, and he attempted only 136 passes past 10 yards all season. That means only 29% of his throws traveled further than 10 yards down the field. Per Cian Fahey of PreSnapReads.com’s Quarterback Catalogue, that would’ve ranked 27th amongst qualifying passers. Cutler also did well extending plays when pressured and also on designed rollouts. Like Tannehill, Cutler is on his best on the move and outside of the pocket. He’s a tough guy, sometimes to a fault like Tannehill, and will keep his eyes up if he can while on the move. But in the pocket, he’s a different player. His lack of improvement throughout his career has left him with limited field vision and an unwillingness (or inability) to get off his pre-snap read the vast majority of snaps. Unlike how Peyton Manning would draw out the play clock as long as possible to manipulate the defense, Cutler does it out of necessity because of his struggles picking out the free-rusher based on number advantages and situational tendencies. Per Football Outsiders, none of Cutler’s Chicago offenses ranked above 20th in pace, a sharp contrast to what Gase did in Denver. Miami ranked last in pace last season, largely due to a defense that needed the offense to slow the hemorrhaging by playing ball-control as much as they could. When the pressure breaks through faster than he expects, he panics and misses simple passes too often. These little details matter a ton for quarterback success, especially when factoring in how they’ll be used. Because Ryan Tannehill was not used the same was in 2017 as Cutler was in 2015 despite having the same coach, there’s uncertainty about what Cutler will run. While Gase cut down on the massive passing attempts that harmed Tannehill’s effectiveness under Joe Philbin and Bill Lazor, he expanded Tannehill’s responsibilities to include protection shifts and full audibling power, in addition to making the offense more vertical than ever. Tannehill thrived, ranking among the most accurate quarterbacks in Fahey’s Quarterback Catalogue both on intermediate and deep routes, a stark contrast to Cutler, who was nearly 20% worse on throws 20-plus yards down the field. 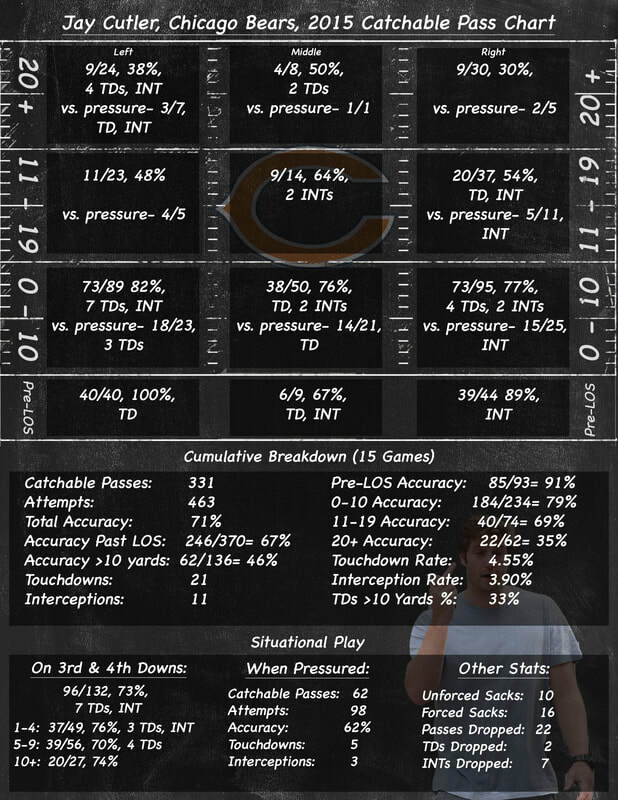 Although Cutler has the arm talent, he’s not nearly as consistent with his feet or eyes as Tannehill, and does not maximize his skill set due to laziness with mechanics and an unwillingness to scan the field. Miami’s playmaker core is better than Chicago’s 2015 group, but not quite as good as Chicago’s 2014 playmaker group, which had Matt Forte, Brandon Marshall, Alshon Jeffery and Martellus Bennett. 2015 wasn’t as kind to Cutler as Marshall moved to New York and Jeffery played in eight games. If DeVante Parker is actually ready to take off, the Dolphins’ receivers along with Jay Ajayi and Damien Williams will give him a variety of threats on each level of the field. It makes the most sense for Gase to revert back to that 2015 West Coast offense more than it does to air it out like he had Tannehill doing as a complement to Ajayi’s punishing outside zone runs. The less Cutler has to account for, the better he’ll do, and Jarvis Landry and the backs excel at creating after the catch. Add in the occasional shot downfield to Parker and Kenny Stills, and the passing offense has upside to be respectable if the interior offensive line can hold up their end of the bargain. If Gase does the opposite, he opens up Cutler’s box of issues, such as limited pocket presence, an inability to hold on to the football when hit (89 career fumbles; 14 in the last 21 games), and struggles hitting receivers on the right shoulder. All but one of his interceptions in 2015 was due to bad accuracy or a bad read, and that was because he was hit while throwing after he didn’t feel blindside pressure. There’s a lot of media optimism around Cutler’s raw stats from 2015, but looking deep at the film showed some of the smoke and mirrors. Cutler had just 11 interceptions with an interception rate of 2.3%, the lowest of any season with more than 10 games played. But he benefitted from seven dropped interceptions, which would have raised his interception rate to 3.9%. That would’ve been the second-highest of his career. While all quarterbacks have dropped interceptions, it’s disingenuous to claim Gase fixed Cutler when Cutler was abnormally lucky with dropped interceptions. Even Gase couldn’t completely stop the recklessness despite doing as much as he could to turn him into Brian Hoyer. The bad will come with the good, explosive plays that he’s been capable of producing. The other options outside of Cutler were extremely limited, with all but Colin Kaepernick being just a backup option. Kaepernick didn’t have the benefit of working with Gase previously though, and that was the difference for the Dolphins. Had Cutler decided to not be a mercenary, the Dolphins would be exploring that option. Being a mercenary can be an advantageous thing for both parties, but Cutler has to be all-in, and not just using this as one last huge paycheck. He has a long history of getting banged up and struggling despite great surrounding talent and schemes, and overcoming that now coming off a major injury that could zap his signature arm strength and at age 34 is a longshot. Cutler is fun to watch because of his backyard-style, and he’s better than Matt Moore, who is basically an 85% of Cutler. The Dolphins have the talent on their roster to challenge for a Wild Card spot if some of the young players progress from last year, and key veterans stay healthy (looking at you, Mike Pouncey). Cutler’s going to be under the magnifying glass after being hand-picked by Gase. It’s up to him now to put in the work to show some of his underwhelming seasons were more of an aberration than legacy-defining.